Still working fine here Jack and I've had it running for over an hour without a hiccup. Not sure if me being located in Australia has any bearing on this though. I've only ever used it when Opera's VPN goes down but I've had no issues with Windscribe since using it. it serves me as a temporary fix but I've never used it long-term. sorry mate I wish I could give you more feedback on the subject. I'm using 'Windscribe' - Free VPN and Ad Blocker at present while this issue is ongoing. I find it a useful option when Opera VPN has this issue. I reckon the more 'extensions' you have enabled in Opera the worse your memory usage will be. at least that's what I've found out since extensions were introduced. I've got to the stage whereby they remain 'disabled' if I don't use them on a regular basis. Nowhere in my 'Preferences' file did it list "browser_action_visible"
their own choice of theme if they could, look at 'Vivaldi' the choices are there at least. Thanks friend for the useful tip ! Tried several times but Mozilla Firefox fails to show in apps selection Windows 10 latest build but thanks again. 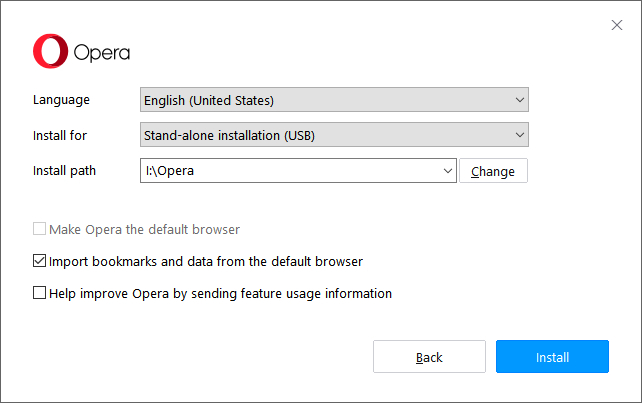 I've now opted to use opera this way instead of having it on my C: Drive, I much prefer it. I chose to install mine to a secondary drive where I keep all my portable programs.